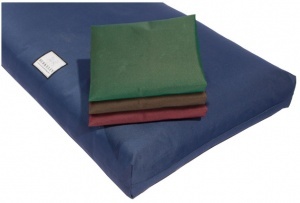 Spare Covers for fitment to Berkeley Pocket Spring Dog Beds. 100% Waterproof PVC-backed polyester pillow case-design sealed with heavy duty ‘Velcro’. Easily removable for machine washing or can be left in place and simply wiped or hosed down. Highly durable fabric that is difficult to damage by chewing / scratching. Flea, Mite, Mould and Mildew resistant. Sheds dog hair easily. Virtually unbreakable nylon thread stitching.